Emergent properties give rise to the next level of complexity and also of order. A new set of phenomena appear (i.e., actually come into existence, so it is not mere appearance). At this new level we discover new laws of this new order, laws that would never be discovered at the level of the substratum of the emergent order. Some simple examples of those laws are those emerging from organic chemistry, where the shape of the very large and complex molecules make possible new emergent molecular properties which are wholly properties of the folding and refolding itself. One such molecular property is that of enzymatic action, where a special mediator molecule, called an enzyme, helps to bridge a molecular reaction between two or more other molecules that could not, otherwise react. The result is yet another complex molecule that has its own nature and behavior that the organic chemist must then study to understand its new laws and emergent properties. Man-made chemical substances, exemplify yet another dimension of emergent properties. The entire field of polymer chemistry and its industrial exploitation by such giants of chemical industry as duPont and Monsanto. For example, through duPont’s exploration of this amazing area of chemistry, have emerged such marvels as Nylon, Rayon, Orlon, Dacron, Lycra, Tyvek®, Sontara®, Kevlar® (puncture resistant and ‘six time stronger that its weight in steel’), Nomex® (heat &amp; flame resistant) material), Mylar®, Tedlar®, Lycra, Freon® (a cloroflorocarbon or CFC) and the list goes on. Here is duPont’s amazing history. These amazing man-made substances could never have appeared without the deliberate experimental chemical modeling and fabrication by applied chemical science. Yet even more amazing is the natural microbiological creation of proteins by living cells, beginning with the nucleic acids (DNA, RNA, tRNA) and the distribution and re-purposing of those large molecules throughout the living cell and the organism’s entire body. How do these large complex molecules emerge? It appears that the key lies in the theory of autocatalytics and its evolution. This theory is discussed in depth by Stuart Kauffman in his seminal book The Origins of Order: Self-Organization and Selection in Evolution, in which Kauffman suggests that the origins of life is an emergent molecular order that is expected and not improbable. How could the blind forces of Nature create large and highly information-laden molecules like DNA and proteins just by random processes? DNA carries information for the synthesis of proteins, but it requires the prior availability of certain protein molecules for performing its genetic duties. Such proteins help the double-helix DNA molecule to uncoil itself and split into two strands for replication purposes. Therefore, DNA and certain proteins must have emerged independently, by some efficient (and therefore reasonably likely) chemical processes. But how? The answer has to do with the chemical evolution of autocatalytic sets of molecules, which could consume energy-rich molecules and other precursors (‘food’) to ‘reproduce’. These molecules were the predecessors of proteins and DNA etc., and thence of life. To experience this process of natural microbiological creation of proteins by living cells (through accurate dynamic digital modeling and animation) makes us deeply aware of the amazing complexity, fine tuning and collaboration occurring in every cell of our bodies and those of all living beings. 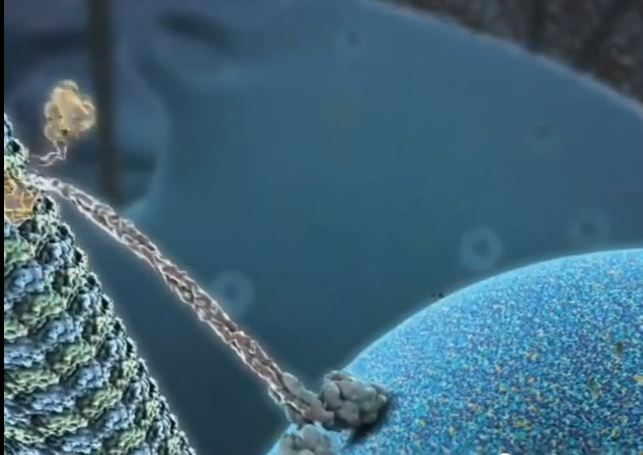 View, for example, this video on DNA and RNA Transcription. Or this video ‘From DNA to Protein‘. There is an excellent video entitled: ‘The Inner Life of a Cell.’ View also this excellent TED video, ‘David Bolinsky: Visualizing the wonder of a living cell‘. Here is recent TED talk on DNA and protein synthesis: https://www.ted.com/talks/drew_berry_animations_of_unseeable_biology . As you have seen from these videos, the more we explore the structure and dynamics of individual cells, the more incredibly complex is its revealed living nature with its amazingly intricate self-maintenance and organizational control that rivals the operation of an advanced industrialized modern city. This is emergence at its most dramatic! Copyright © 2014, 2015 by Jack H. Schwartz (a.k.a. bioperipatetic). All rights reserved.